In this chapter, the author explores the concept of gamification in general and in context with employee engagement. The emergence and definitions of gamification are explained in the initial part of the chapter. Later, the benefits of gamification, in general, are listed and the linkage between the two (i.e., employee engagement and gamification) is explained. The broad aim of this chapter is to explore gamification as a strategy for employee engagement in the 21st century organizations and how these two are linked. The focus areas for the implementation of gamification form the proceeding section of the chapter. The chapter also highlights the benefits and criticism of gamification. Later, the author states the ways by which organizations are benefitted with the application of gamification. The criticism of gamification is discussed in the concluding part of the chapter, and the chapter will also facilitate the readers by exemplifying how organizations implement gamification on a realistic level. In today’s dynamic work environment, where average tenure of an employee is 4.4 years and job security is doubtful, it is hard for employers to engage employees (Employee tenure summary, 2012). The practitioners in the field of Human Resources claim that employee engagement is essential to organizations’ success. Studies have even proved that engagement helps organizations’ bottom lines (Epstein, 2013). A study by Kruse (2012) highlights the fact that companies with high engagement have higher customer loyalty and sales, fewer quality errors, lower turnover and absenteeism, and higher overall revenue and shareholder returns. The efficiency of Human Resource Management field can be measured in many ways, but employee engagement stands out to be the most significant ones. This is the reason for which employee engagement is still a topic of wide research from years. But it is not easy for organizations to keep their employees engaged one of the major cause being entry of younger generation representatives in the workforce. Hence organizations are bound to inspect and implement some of the new tools and techniques that respond more effectively to engagement needs. While highlighting the importance of employee engagement, former General Electric CEO Jack Welch stated that when ranked, employee engagement should come first, with customer satisfaction and free cash flow coming in second and third, respectively (Mello, 2015). Within the last two decades, employee engagement has become a matter of concern for organizations specifically for their HR department. Most HR leaders across the world are keeping a regular watch on their employee engagement scores and businesses are also making efforts to build teams that are inclusive, passionate and multi-generational by nature (Bersin, 2014). Such teams are assumed to outperform increasing competition. 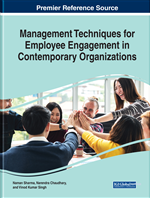 Literature and research in the field of management suggest many employee engagement drivers that can boost productivity. Research also shows that the engaged employees are more likely to present desirable behavior and attitudes at work. They are more committed to the organization and effectively contribute towards the betterment of it (Harter et al., 2002). Few efforts on the part of organization also lead to better engagement of employees; caring management and visionary leadership, inspiring goals, meaningful work, personal growth, and development, are a few of them. Some of the most commonly used employee engagement initiatives include feedback and goal tracking, engagement surveys and encouraging employee feedback, ensuring employees’ comfort with the organizational culture, events like special lunches for recognition, and rewards programs also contribute to it (Clark, 2012). Some companies even create internal social networks and learning management systems to improve engagement. The above-mentioned engagement initiatives and games both use elements like technology, feedback, and rewards. Most of the sources also suggest that in order to make the employees feel true ownership for their duties it is important to keep them informed about business goals and processes. It is also seen that companies that have engaged and empowered employees are able to increase customer satisfaction by over 40 percent, improve profitability by nearly 30 percent and boost the overall performance by nearly 36 percent (Melcrum n. d.). Organizations have now realized that the abovementioned initiatives do somewhere lack in providing intrinsic motivation and workplace can be well suited to modern concepts like enterprise gamification for engaging employees. Some organizations even combine gamification systems with their social networks and linkage with game mechanics in order to increase participation of employees. Some organizations have also started taking related employee achievements into account to give more comprehensive, quantifiable performance reviews (Stevens, 2012). However, the degree to which organizations apply gamification and the weight they give to it may vary (Epstein, 2013).